Before Old Yeller or Where the Red Fern Grows, there was Big Red, the classic boy-and-dog story of adventure and friendship in the wild mountains of Pennsylvania. Danny, a trapper's son, knows more about the woods, trapping, and hunting than he does about the big city or dog shows, but when Red's owner sees seventeen-year-old Danny's love for the dog, he entrusts the boy with training the champion Irish Setter. 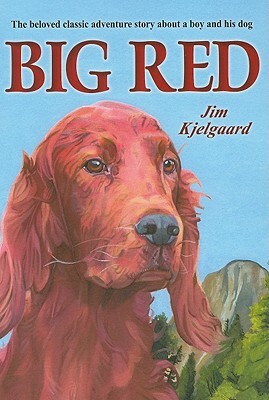 Filled with heart, and loved by young readers for decades, this timeless classic thrills with backwoods adventure as Danny and Red challenge Old Majesty, the biggest, most dangerous bear of the Wintapi, meet the challenges of the wild country, compete in championship dog shows, and become best friends. Bob Kuhn, the award-winning wildlife illustrator, contributes black-and-white drawings that open each chapter. This much-loved classic is great for kids who love dogs, adventure, and the outdoors, plus it's a great read aloud showing the value of courage, friendship, and overcoming adversity. Jim Kjelgaard spent his boyhood in country much like that described in this book. "Those mountain farms", he remembers, "produced more rocks to the acre than anything else. But they provided my brothers and me with plenty of ammunition for fighting the neighboring boys across the creek. One of our jobs was to shoo the cows out of the corn patch, which was more exciting than it sounds. There were always two or three yearling bulls in the dairy herd, and when we wanted to get home quickly, we'd each grab one by the tail. The bulls would light out for the barn, their feet hitting the ground about every two yards, and ours in proportion. But the really entrancing thing was the forest that surounded us: mountains filled with game, and trout streams loaded with fish." Jim's first book was "Forest Patrol", based on the wilderness experiences of himself and his brother, a forest ranger. "Big Red," "Irish Red," and "Outlaw Red" are dog stories about Irish setters.